Go on a crazy adventure in a new world just like Dorothy in the Wizard of Oz in this child ruby red shoes. The sparkling shoes are decorated with a red bow on the toes and have a red spangled shell. 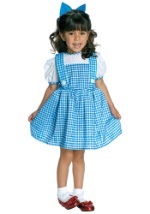 Slip these shoes on with one of our Dorothy costumes and hit the yellow brick road this Halloween season.